Contains sodium salt of the multiple feed active ingredient Diphacinone. Each pouch can be mixed with 1 quart of water to prepare a liquid bait to kill Norway Rats, Roof Rats and House Mice. 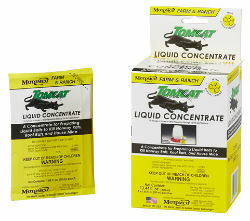 Even when rodents have an available food source, they still drink water, so Tomcat Liquid Concentrate is an excellent way to supplement a rodent control program especially in hot, dry conditions. Mixed product can be placed in a chicken feeder or any container where rodents will seek out a water source.